Citation Information: JCI Insight. 2016;1(15):e86615. https://doi.org/10.1172/jci.insight.86615. Levodopa-induced dyskinesia (LID) is the most common, disruptive complication of Parkinson’s disease (PD) pharmacotherapy, yet despite decades of research, the changes in regional brain function underlying LID remain largely unknown. We previously found that the cerebral vasomotor and metabolic responses to levodopa are dissociated in PD subjects. Nonetheless, it is unclear whether levodopa-mediated dissociation is exaggerated in LID or distinguishes LID from non-LID subjects. To explore this possibility, we used dual-tracer positron emission tomography to quantify regional cerebral blood flow and metabolic activity in 28 PD subjects (14 LID, 14 non-LID), scanned before and during intravenous levodopa infusion. Levodopa-mediated dissociation was most prominent in the posterior putamen (P < 0.0001) and greater in LID than in non-LID and test-retest subjects. Strikingly, LID subjects also showed increased sensorimotor cortex (SMC) activity in the baseline, unmedicated state. Imaging data from an independent PD sample (106 subjects) linked these differences to loss of mesocortical dopamine terminals in advanced patients. In aggregate, the data suggest that LID results from an overactive vasomotor response to levodopa in the putamen on a background of disease-related increases in SMC activity. LID may thus be amenable to treatment that modulates the function of these 2 regions. Dissociation of vasomotor and metabolic responses to levodopa in Parkinson’s disease subjects with and without levodopa-induced dyskinesias (LID). (A) Scans of cerebral blood flow (CBF) and cerebral metabolic rate (CMR) for glucose were acquired at baseline (OFF) and during levodopa infusion (ON) in 14 Parkinson’s disease (PD) subjects with stable motor responses to drug and no dyskinesia (see text). Voxel-wise analysis of the scan data from these non-LID subjects (NLID) revealed significant dissociation of vasomotor (ΔCBFON-OFF) and metabolic (ΔCMRON-OFF) responses to levodopa in the posterior putamen, the internal globus pallidus, the ventrolateral thalamus (top), and the dorsal pons and midbrain (bottom). Clusters were displayed using a red–yellow scale thresholded at T = 3.14 (P < 0.001, uncorrected, with cluster extent >100 voxels), superimposed on a single-subject MRI template. (B) Dissociation index values (DI = ΔCBFON-OFF – ΔCMRON-OFF) were computed for each of the significant regions identified in the NLID analysis. DI values for each region were then computed for the 14 PD subjects who displayed LID during drug infusion, and for the 8 test-retest (TRT) subjects (see text). 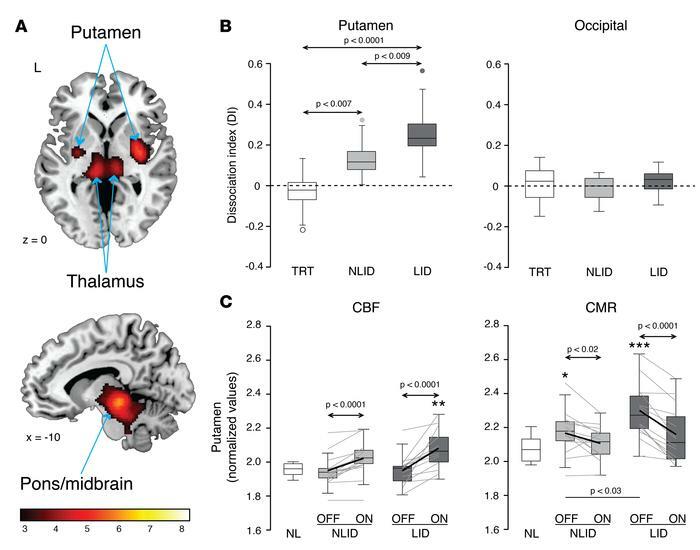 Of the significant dissociation regions (Table 1), the putamen showed the largest group differences in DI (left). The occipital reference region showed no such changes (right). (C) Regional CBF and CMR values were computed in a volume of interest corresponding to putamen dissociation region identified in the NLID analysis (Table 1). Putamen CBF values (left) measured during levodopa infusion reached abnormally high levels in LID but not NLID subjects. By contrast, CMR values measured in the same region (right) were significantly elevated at baseline in both LID and NLID subjects, declining to normal levels during levodopa infusion. In the box-whisker plots, here and in Figure 3, gray lines denote paired values for individual subjects. Arrows indicate post hoc Bonferroni tests for group comparisons in the 1-way ANOVA (B) or 2-way 2 × 2 repeated-measures ANOVA (C). Horizontal bars represent Student’s t test between groups. *P < 0.05, **P < 0.01, ***P < 0.001, Student’s t test compared with normal (NL; n = 14) values.